We humbly present to You, dear reader, a Philosophy of Balance. Keep what you Will and Make it your Own. ANARCHY = from Greek “No Ruler”, a state of human organization free from centralized directive authority. VEGAN = a lifestyle philosophy striving to minimize animal suffering through conscious consumption. CAPITALISM = economic system in which freely-contracting individuals trade value for mutual benefit. Obviously these are three words that each stir controversy in the minds of many people. In the vocabulary of the modern Western citizen, Anarchy is synonymous with destructive chaos, Vegan connotes an extreme and limiting dietary choice, and Capitalism is generally reviled as the origin of evil at worst and risky at best. We seek to redeem these words. Rome wasn’t built in a day, nor did it fall in a day. If we propose building a new world, we do so with the realization that it takes time and work. We may not know what the solutions to every problem are, but we do know that a peaceful planet is not capable of being achieved through violence and coercion. The pathology that seems to have taken the mind of the human species for the last few hundred years is that our lives consist of a solely material existence, and everything beyond the physically and scientifically provable is unreal. Every discovery, however, entails a revealing of how our previous understanding of a situation was wrong because of artificially narrow limitations in our perception of reality. The puzzle was incomplete, so to speak. The time has come for the human species to cast off a few of the major shackles holding it back from an eminent accelerated course of evolution. The three pillars that shall be knocked down in this discourse are HUMAN SLAVERY, ANIMAL SLAVERY and DEBT-BASED MONEY. With this philosophical basis and context, our videos and writings will (hopefully) make more sense. The natural state of human affairs is unconstrained by violent external force, in other words, all interactions are voluntary. Ireland existed as a complex culture and civilization without any central government authority for 9,000 years until 1640 AD when the English invaded, ending a longstanding tradition of Irish sovereignty. For 2,000 years, the region of the Southeast Asian highlands known as Zomia has housed over 100 million people in a cohesive culture without any central state, relying on a vast interpersonal market respecting material wealth as well as hard work and spiritual discipline. This brings us to the crux of the issue with Anarchy: human beings must be virtuous in order to be free. All people regardless of caste, color, or creed can agree that it is morally wrong to initiate violence against another conscious being. This as an ethical standard is known as the Non-Aggression Principle. All determinations of JUSTICE as it applies to reality are found through the lens of this principle. All modern forms of government, being institutionalized structures of aggressive violence, are anathema to LIBERTY. If we value Justice and Liberty as a species, then we cannot rely on government to make the world a better place. We stand here in 2014, with such vast and expanding resources as the internet, 3D printing, and low-cost renewable energy, and huge problems taking place on our planet that need to be addressed. We are being called to action. Claim your inner super-hero and realize that you are the change you wish upon the world. It’s time to stop the incessant arguing and get our hands dirty as individuals in whatever creative endeavor calls to us. We don’t need to overthrow the government, we only need to make it irrelevant. That being said, the practical transition to a world of true Freedom cannot be achieved through violent revolution, nor can it be manifested through voting. Only by taking direct control over our own destiny in all its many facets as individuals can we enable the full expression of our collective human potential. In summary, we do not support violent means to achieve peaceful ends. Humans can survive on several different kinds of food. We have evolved to break down many types of organic compounds in order to maximize our potential diet portfolio for the purpose of future evolution of the species. The brain, bones, skin, and nerves of the body all use small amounts of various trace minerals and elements in order to maintain specific functions for the component cells, so in general, variety of diet is good. Though there is no scientifically provable claim that any one particular diet is perfect for all human beings, all studies agree on a general axiom of advice: “Eat Food, Not Too Much, Mostly Plants.” The tendency of highly processed foods causing general ill health is obvious and has been documented thoroughly in books and documentaries. The argument for dietary health then comes to a debate over the merits of a Vegan diet consisting of all plant-based foods and more meat-centered diets like Paleo. That discussion boils down to a question of our views about human evolution: past, present, and future. It is fortunate that humans can eat the meat of animals so that we may survive in an Ice Age or some other climate disruption during which time plant food could become scarce, causing starvation. In any stable planetary climate pattern, plant food must always be more abundant than the animals eating it. Furthermore, there is nothing in animal meat as far as nutrition goes that cannot be gained by eating plant-based living foods directly (including vitamin B12). Life force is the electrical charge held by living organisms that imparts nutrition when consumed, be it plant or animal in origin. This is why all carnivorous animals on planet earth eat muscle flesh raw and ripped from living or recently killed prey. No predator in nature, besides man, cooks the animal it kills for food. By comparison, quantities of life force can be quite easily consumed from a fresh tomato off the vine, or any other unprocessed plant foods. Such vital nutrients can be concentrated through practices like juicing. The plants are the organisms of planet earth that correlate to the Sun, for they are the collectors and record-keepers of the light that shines from our local star. It is no mystical platitude to say that the Sun is the source of ALL LIFE ON EARTH and its energy is the purest form we may access. Meat itself is decaying flesh holding energy that the animal originally took from plants, who took their energy directly from the Sun. There is evidence that human beings are capable of consuming sunlight directly through the eyes. In our perspective of upward evolution, we consider the path of Vegan to be harmonious with Earth. It takes each person a different amount of time to realize the TRUTH inherent in a path that respects all conscious life in a lattice-grid network of symbiosis. Mankind’s existence is central to the web of life, we are tasked as farmers and gardeners to maintain the balance of Life on this planet. So, in summary, we do not advocate a single dietary plan for all people everywhere. It is not a realistic goal to believe everyone will become Vegan overnight. However, we believe it is important for people of all dietary persuasions, eating meat of whatever kind in whatever quantity, to find a way to become connected to their food and know where it comes from and what it’s made of. This is not an extreme suggestion, and GOOD FOOD TASTES AWESOME. It’s not like we’re asking you to eat peppercorns and mud all day. Eat real food, not too much, mostly plants. Deal? Surely there are Anarchist Vegans out there, but many of them remain confused because they are often unaware of economics. Understand that some basic incentive system exists for spheres of human activity at any scale. As individuals, we seek to profit by our every daily action with satisfaction. Eating food, having shelter from the elements, and drinking clean water are all generally preferable aspects of living as a human being on planet Earth. Recognize that a seed profits by each cycle of night and day as it transforms the raw material of air and water to create Life. We all expand and contract by a universal cycle of growth. Nature is a marketplace of energy transactions, and we as human beings are not exempt from Natural Law. In order to be faithful to TRUTH, we must acknowledge the true meaning of words, not just the emotional connotations we associate with them. Today human beings maintain a habit of tossing around words without regard for their meaning. Capitalism in true form is exactly as defined above, a manner of economic exchange whereby individuals freely and voluntarily trade value for mutual benefit. Working for a wage or salary is trading a commitment of time for payment in accepted currency. Having the opportunity to trade our time for currency allows us to expand and improve areas of our lives that are lacking in satisfaction. If we are able to produce more value than we consume, then we earn the ability to conserve our produced value in the form of currency to invest in GOOD IDEAS like feeding hungry children (yours or others) and making the world more pleasant and beautiful in general. This ability to invest in good ideas at all scales is known as CAPITAL. These days we have a media debate about raising the government-mandated minimum wage, but few acknowledge the perspective that history offers us in answering this question. In 1963, the year John F. Kennedy was assassinated, the federal minimum wage was $1.25. However, those five quarters were comprised of 90% silver. The same five quarters would be worth over $20 today in melt value alone, yet we debate about the federal government making a law to raise the minimum hourly payment of dollars that the federal government has made all but worthless. Something seems amiss. Most people would agree that Capitalism and Communism are polar opposites. Karl Marx lists the establishment of a central bank as the fifth plank in the Communist Manifesto. Yet, the United States of America, a supposed “free market capitalist” country has the Federal Reserve, a central bank that governs the issuance of credit (MONEY) to nearly every other bank in the world. The reason for this state of affairs, with the United States Dollar used all over the world as supreme world currency, is dependent upon the fact that all major oil purchases must be made using U.S. dollars, and the only thing that maintains that reality is the United States world military empire. The U.S. Navy fleet completely eclipses the naval fleets of all other governments in the world, combined. Thus the Federal Reserve is able to print as many U.S. dollars as the federal government can spend because nobody with half a brain would challenge the U.S. military in a contest of arms. So we have violence on a global scale (world military empire) enabling a criminal and psychopathic group of ultra-wealthy human beings (directors of Fed-affiliated banks and major corporations) to declare by coercive force that billions of other humans starve in physical and/or mental poverty, and this is what we as a culture call Capitalism? Something is amiss. The greatest hope we have when it comes to solving the problems we face as a species is in the spirit of entrepreneurship. The relative ease by which a human being may trade value freely without external arbitrary restraint is the measure of how much a human being can influence the world, for better or worse. Our best bet in promoting ethical behavior in the marketplace is by playing the role of conscious consumers, and being steadfast in our commitment to TRUTH in our words and actions and LIBERTY in our hearts and minds. Given the universal axiom of peaceful interaction symbolized in the non-aggression principle, Freedom is the only thing we can really all agree on. ANARCHO-VEGAN-CAPITALISM is a mouthful and a mindful for sure, but it isn’t really an extreme philosophy — rather it is growing all over the place. For an example of a private, voluntary association of humans managing a non-profit company that takes care of rescued farm animals, check out our latest episode of MANGO & SPACE PANTHER EXPLORE THE UNIVERSE as we visit Animal Place in Grass Valley, California. 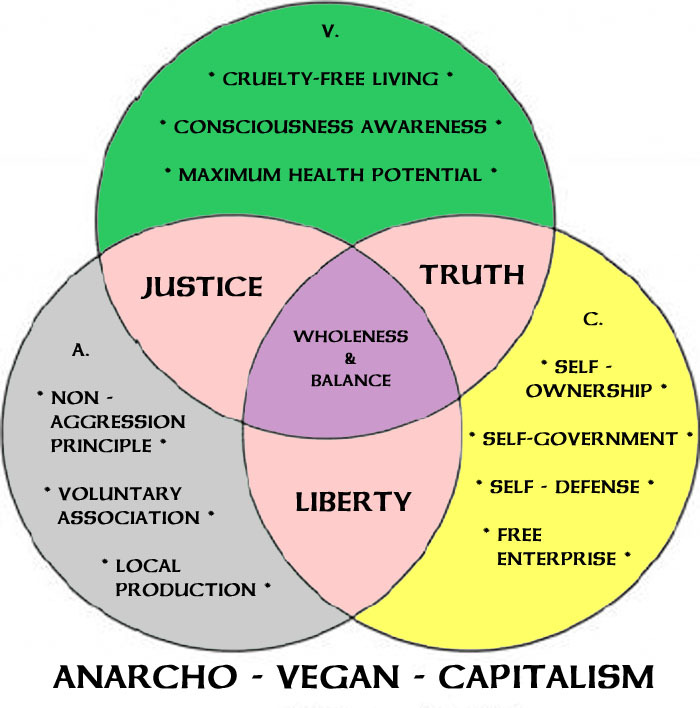 Wow, this make so happy and hopeful to find other Vegan Anarcho-Capitalists! I know of many other An-Caps and other Vegans but most of them don’t seem to make the logical connection they have with each other. A lot of Vegans seem to be more leftist because they think “capitalism” causes animal cruelty, and a lot of An-Caps don’t seem to think about how the NAP also applies to animals. I agree that I don’t know if it’s completely possible for the whole world to go 100% Vegan (though that’d be awesome), but I do think that as soon as the government gets out of the meat/dairy industry and more people become conscious of the NAP and what they buy, that animal cruelty will go down significantly. Thank you for making this page and spreading the truth! I was already vegan for moral and ethical reasons, and a believer in capitalism, but I resisted the idea of anarchy. My adult children introduced the idea to me but I felt it wasn’t possible given the state of human consciousness at this point in time. So many people have been brainwashed into completely abdicating personal responsibility on any level. They have been devoid of true education for so long that I couldn’t see a way forward. I read the information on your facebook page and was SO inspired. It is very well-written and moving. While I agree that we may never have a completely vegan world, just as we may never have a world without killing humans, I certainly believe it is what we should strive for. Thank you for all you do.